Pierwszy raz firma oferuje wspomaganie kierownicy. Power steering is offered for the first time this year. EASY ON THE EYE, and easy to buy-that's the quick story of the high-styled, generously sized SUPER. 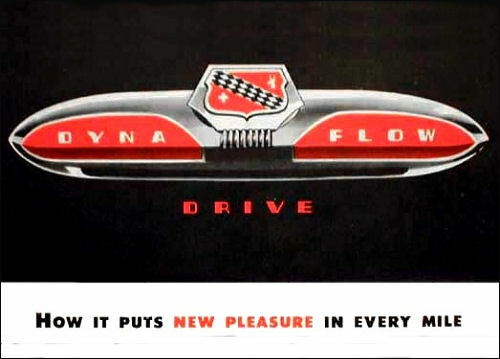 With this dashing beauty, you get the truly thrilling performance of Buick's brilliant F-263 Fireball Engine and all the generous gas mileage of its valve-in-head high-compression efficiency-with 124 horsepower on Synchro-Mesh models, 128 horsepower on Dynaflow Drive models (at extra cost). 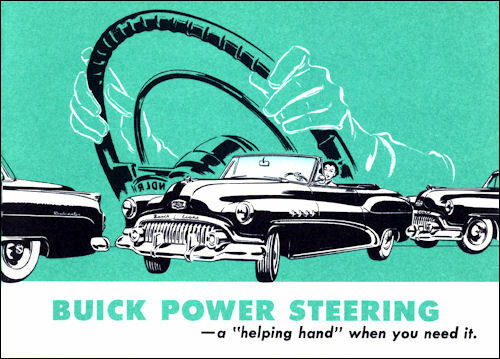 You get the solid comfort of Buick's all-coil-spring ride and the soft comfort of gently-yielding seat cushions. You get richly fashioned interiors, with new fabrics, fittings, and finish of smart taste and impeccable quality. 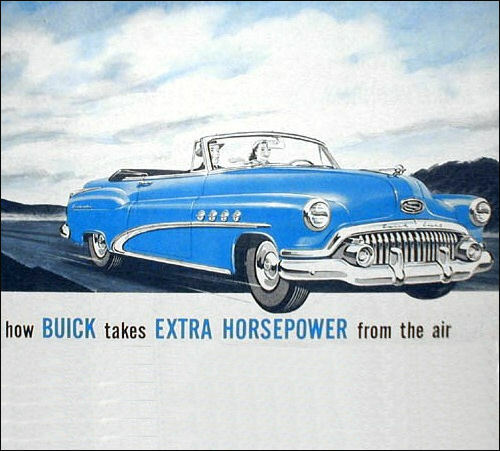 You get, too, superb handling ease-whether you take the big 121 ½ inch wheelbase, or the regally sized SUPER Riviera Sedan of 125 ½ inch wheelbase. Whatever your choice, you'll travel superbly well in the superlative SUPER-biggest buy in the medium-price field. 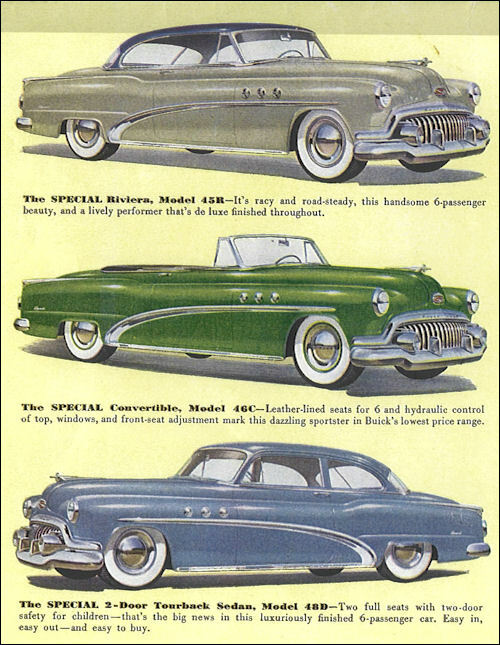 The SUPER Riviera Sedan, Model 52 – Bigest of the big -buy SUPERS, this extra-long 4-door beauty rides on 125 ½ -inch wheelbase, carries six in more than spacious comfort. Note the generous sweep of extra side windows, and the lively, rangy look of this smooth-stepping traveler. 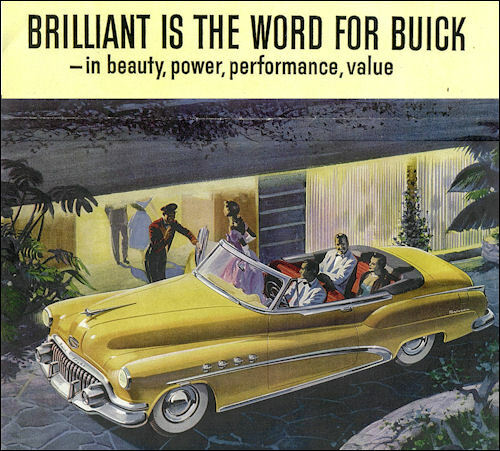 The SUPER Convertible, Model 56C – Stunning lines and sparkling brilliance of action keynote this lithe and graceful all-weather Buick. Room for six, of course plus hydraulic controls for top, window, and front-seat adjustment. The SUPER Riviera, Model 56R – Here's the Convertible look with the Sedan comfort of a permanent steel roof. It's racy of line, seats six in comfort, has almost as much visibility as a top-down Convertible. The SUPER Estate Wagon, Model 59 – For those who combine city life with country living, and want a spirited motorcar which smartly serves both. Seasoned wood and sturdy metal dress this 4-door carrier of six big people and all their gear or luggage. Look with special interest at these very special beauties. 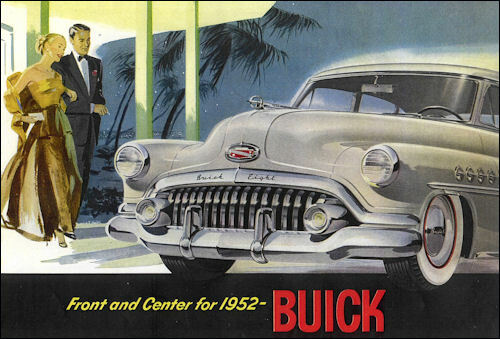 For here is thoroughbred Buick building in a true budget price range. Here is the serene comfort of the Buick dream ride, the swift response of Fireball valve-in-head engine power, the room and size and feather-light handling ease so typically Buick's-all in a complete line of smart automobiles – and each priced low enough for any new-car budget. Wheelbase is a convenient 121 ½ inches. Engine is the big F-263 Fireball eight-with 120-hp on Synchro-Mesh models, 128-hp on Dynaflow models (at extra cost) – and with the high miles-per-gallon economy of this high-efficiency valve-in-head power plant. If it's luxury you want-luxury of room and fabrics, of ride and power, of style and silky smoothness-at a bedrock price-the SPECIAL is a very special buy. 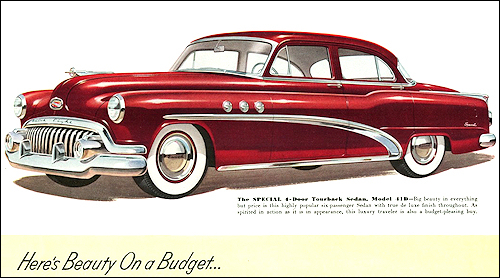 The SPECIAL 4-Door Tourback Sedan, Model 41D – Big beauty in everything but price is this highly popular six-passenger Sedan with true de luxe finish throughout. As spirited in action as it is in appearance, this luxury traveler is also a budget-pleasing buy. 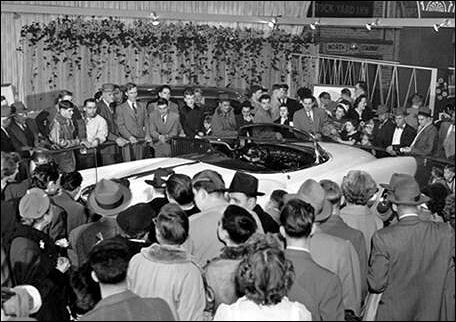 1951 XP-300 prototype at Chicago Motor Show.